I get asked a lot about whether e-Commerce companies should be using product page videos so I have compiled a simple 7 step up to date guide as some of the advice that is out there has quickly dated. 1. Should I be Using Video On Product Pages? The bottom line is that users are 65-85% more likely to buy a product after they have watched a video about it. However, it really depends on what you are trying to achieve which of course should be governed by user intent. In July last year, Google stopped showing rich snippets in search for many pages that featured videos. 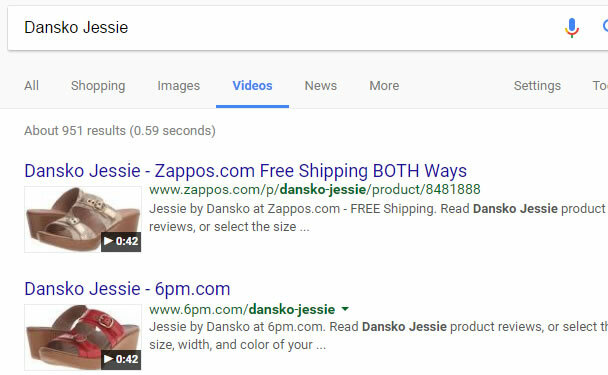 Whereas previously you would have seen a small thumbnail with a running time in the search result for your page, now there is nothing at all apart from the listing itself. This is because when a user hits ‘All’ the intent is to search for the product. Seeing a video of that product is not the first intent. 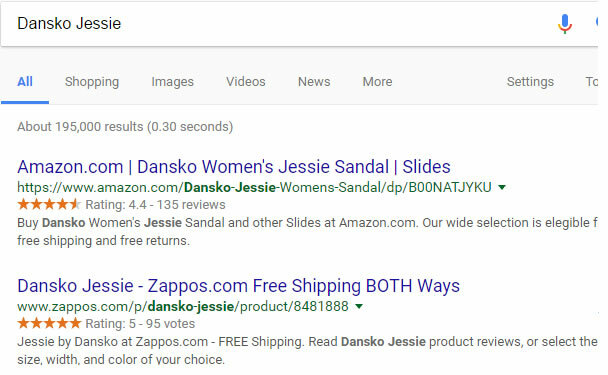 This is the result for the search “Dansko Jessie” and here you can see that the Zappos page, (one of the best online retailers out there SEO wise), is featured second. Now there is a video for the product on that page but the rich snippet is not shown. (I have chosen this as it’s a relatively new product). This is because the intent when searching for that product using the ‘All’ button is not to see a video. If we then slip over to the Video Search page then the product is shown there at the very top. So even though the user intent is to find the product, Google will not show a video in the search results. It is only when the user searches for a video for that product that Google will serve the most appropriate page because the intent has changed. It is quite clear that even after the algorithm change last year there is a clear advantage to hosting videos on a page and that it is very good for SEO. The rich snippets on the page appear to still count towards the overall SEO and the pages with video content appear very high. 2. Should I Host My Product Page Videos On Youtube? When you host a video on a page, the absolute best way of featuring the video is from your own server. It’s natural and part of the website so all the attribution will go to your own domain. If you host on YouTube then guess what happens? Yes, the Youtube page will feature high in SERPS and your own page will drop much lower. I saw this many times when running my own business. Google is bound to show it’s own YouTube videos first as it owns the company. Of course, your own intent may be different. You may want the video to be shown on YouTube because that gives you the ability to advertise the page using Adwords. You may have a neat link below the video redirecting users back to your page. (Hint: very few will hit it). There may be other reasons why a YouTube video is more appropriate than hosting on your own site. If you are going to do this then change the title of the video so it suits a Youtube user. It will then serve up the most appropriate video. So if you want to optimise for Youtube then think about the above keywords before naming your video. If you need to self-host then think about a CDN, (Content Delivery Network) or external video depositories like Wistia and Vimeo Pro. These allow you to add rich snippets and a video sitemap to your site to help Google discover the video content. You can then serve the video directly on to your pages and not on Youtube. Wistia and Vimeo hide your video on their servers so it is not visible from their side giving to the perfect alternative to save that vital bandwidth for showing off the product! You are focusing on getting people to sit and watch the video of your product. So don’t produce something that the user is going to click off after a few seconds. The more engaging the video then the more likely the user is going to sit through it to the end. This is SEO gold! you want people to interact with your page, to stay and watch and ultimately be turned from a casual browser to an active buyer. Make the video decent quality – no one is looking for a super professionally shot video in a studio, but take the time to learn how to rattle off the most important attributes of the product. Smile and be engaging and if you can’t then find someone in your office who can. These are Zappos employees, not actors. You can do this trust me. Have someone be seen using the product – it makes all the difference! Finally, keep the product videos short! no one wants to sit through a 10-minute product video. I recommend 1-minute maximum! If you follow MOZ, (and you should), you will know that they have a weekly blog post called Whiteboard Friday. Here they produce really useful SEO tips on how to create the best user experience so your site ranks highly in SERPS. 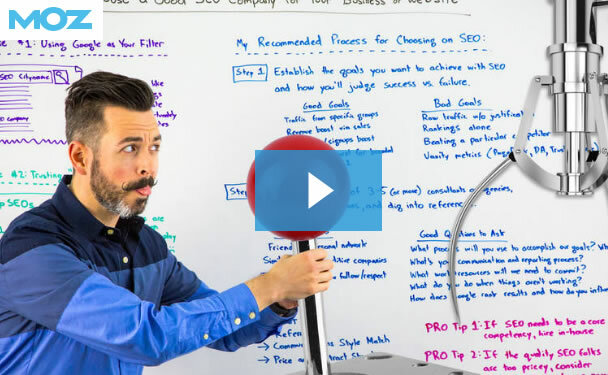 Often the site owner Rand Fishkin will present a video on the subject and always, there will be a transcript of the video beneath. Now, this is a toughie. It takes a long time to transcribe video, but it’s not impossible. Moz uses Speechpad themselves which start at a $1 a minute but there are many other services you can use. 5. Should I host My Product Video On YouTube and My Own Site? As we explained earlier this is not a good idea because the YouTube version will be featured high in Google and yours will be dumped down. Howeve, you may be able to get the best of both worlds with this little trick. If you host the video on your own page for three months then Google assigns the authorship and originality to you. You can then upload it to YouTube and start to market that page with a link back to your own. This is what MOZ occasionally do when they syndicate out content, get authority then share. MOZ mentions this briefly in their Refurbishing Top Content Post – I recommend you watch it! Don’t bury the video link deep in the product pages – make them easy to find so that the user can watch them without having to search too hard. This may seem obvious but even Zappos have other videos at the bottom, and frankly, if it was me I would be using a video thumbnail, not a video icon! Google will not increase the visibility of your video just because you have a load of backlinks from Facebook or other social platforms. You will however benefit from people visiting your pages because you have shared the page. If you make a great video, an instructional video or just a plain damn funny video then people will want to share it. So make them fun and get people visiting your page. Ultimately they may get shared on Blogs and other sites with good domain authority – just what you need to help your page rise to the top. The bottom line is to have fun making the videos because that will come across in the final edit! You will see that the original MOZ video was posted on the 30th of December 2016. Then MOZ posted this on Youtube on the 23rd May 2017 – that’s nearly 5 months later. And can you see? the titles are slightly different – giving MOZ the lead on searches like ‘SEO Strategy 2017’.